This new feature is not yet broadly available to all Plus Schools. District administrators interested in this feature should contact School Loop for more information. Chronic absenteeism is a key indicator for students at-risk. Tracking attendance and identifying trends are vital to the effectiveness of your attendance-related intervention programs. School Loop can help. 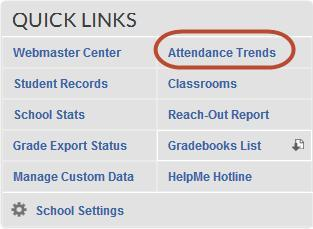 After including attendance data in your daily imports, the attendance trending tools can be enabled. These tools not only allow you to see attendance trends for students at Significant Risk (above 10% absences) and Severe Risk (above 20% absences) by date, grade level, and period number but also displays which students are in each category. Moreover, Trackers for each group are automatically generated. Configuration is simple. Just let us know the attendance codes you wish to count as absences. Quick Links on their portal homepage. Clicking this link will take you to the trending graphs - the default view picture above shows a running trend of the number of students in the Significant Risk and Severe Risk categories (above 10% and 20% absences respectively) as well as the overall numbers of students at-risk. 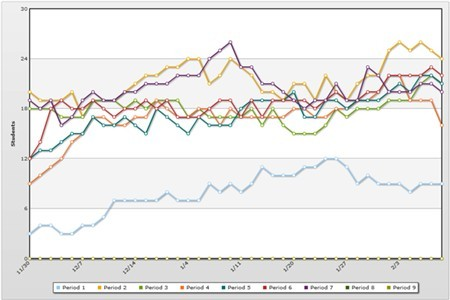 Hover over the bars or anchor points in the line graph to view the date and number of students in that category. For additional graphs, use the pull-down menu at the top-left of the chart. 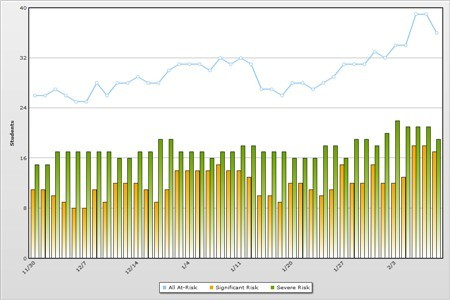 The available graphs allow you to analyze trends for both the Significant and Severe Risk students by date, grade level, and period number. The graph for trending by period number is pictured below. In addition to the trending charts, we also provide you with the same information in tabular format. Click the View Data button at the top right of the charts to access the data tables. Each table is sortable. Click the column headings to toggle between ascending and descending sorting. When you drill down by date on the data tables, we present you with a list of students who were absent on that particular day. Each student's name in the list is a link to a page displaying all of their attendance for the current school year. We also indicate which students were newly added or dropped from a category. The data from all of these charts and tables are downloadable as CSV files, which can be opened by Excel or other spreadsheet applications. To grab your data, click the Download button located at the top-right of each graph and table. Now that we have identified which student is at-risk based on their attendance, it is time to track their academic performance using one of the three Students Trackers automatically created by our system: All At-Risk, Significant Risk, and Severe Risk. As with all Trackers, you can view each student's overall average for all courses, a number of assignments with zeros, and how many of their teachers are publishing grades. Additionally, you can easily compose and send LoopMail messages to any or all members of the student's Learning Management Team. For more information, review our help pages covering all the features of Student Trackers. Typically, schools have several different codes for absences - medical, excused, field trip, etc. - but for the Chronic Absence Tracker, you specify which attendance codes will be counted towards chronic absences. Initially, it takes 20 days of accumulated attendance before any trends are displayed. From that point forward, trends are based on a running 20-day window. When the system calculates trends, the following rules apply. Once a student reaches either 10% or 20% absences, they are automatically added to the corresponding risk group - Significant or Severe. To move from the Severe risk group to the Significant risk group, the student's absence rate must drop to 10% or less. To be removed from the Significant risk group, the student's absence rate must drop to 5% or less. If period absences are reported, missing 50% or more of the periods in student's schedule counts as a full day of absence. In other words, a student who misses 2 of 4 periods in a day is credited with a full day absence. A student with 6 periods must miss 3 periods. Attendance risk by period is calculated separately from day absences. For example, a student with 5 classes who missed the first period 5 times in the past 20 days but has no other absences, will be in the Significant risk category for period 1 (25% absence rate) but will not be in any risk category for day absences.